How we design, maintain and use our outdoor spaces has sustainability implications. The university has a beautiful landscape—more than 55 hectares of grass, trees, bushes and gardens—all of which require care. Facilities Management Division's Grounds Department, strives to maintain and develop this landscape using the most sustainable practices possible. Since 2005, Facilities Management has been installing and adding to a central control irrigation system. The system includes satellite irrigation control stations throughout campus which provide data on temperature, evaporation, and rainfall, as well as water flows. Based on this information, the system ensures that watering happens under optimal conditions at optimal rates. Rainwater is collected from the roof of the University Services Building into an enormous rain barrel—over 4,500 litres. 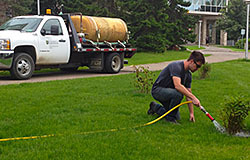 Water is transferred a water truck and used on newly and existing landscaped areas around campus. Grounds strives to find ways to make our landscaping less dependent on water. In addition to specifying drought tolerant plants in areas outside of the bowl, Grounds uses a prairie-hardy seed mix for turfed areas. In addition to requiring less irrigation, the mix stands up well in high-traffic areas like the Bowl and sports playing fields. More than 90% of leaves and grass clipping from campus are turned into valuable compost. Every year the Grounds windrow compost produces nearly 1,000 cubic metres of rich compost for use on campus. This saves more than $60,000/yr for purchasing fertilzer or compost. Tree branches and shrubs are chipped to cover the windrow compost to eliminate odours. Putting this "waste" to use this way avoids sending more than 50 truckloads to the landfill at $300/load, saving another $15,000 annually. 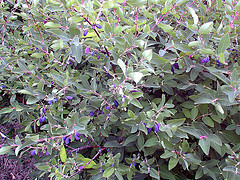 A variety of techniques and strategies are used to eliminate or reduce the need for pesticides. For example, hot water under pressure is used in parking lots and other paved areas to control weeds. Horticulture Club Community Garden at the university's greenhouses on 14th Street. To learn more about community gardens on campus, visit our community gardens page. Thanks to the vision, effort and enthusiasm of a group of volunteers, University Club patrons enjoy the freshest, most locally grown herbs. Volunteers from the Permaculture Research Institute of Saskatchewan worked with the Club’s staff, the Office of Sustainability and the Grounds Department to plan a small herb garden. The herb spiral design pictured here was chosen because it maximizes use of small garden spaces while providing a range of growing conditions. 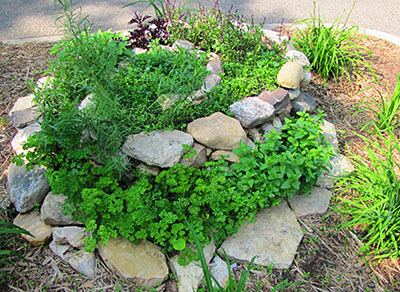 Herbs are placed to take advantage of the downhill flow and drainage of water—ones preferring drier soils at the top, water-loving ones at the bottom. Sun-loving herbs are planted on the south side and more shade-tolerant species on the north. The College of Education's Prairie Habitat garden is designed to be a source of education by offering students a chance to see prairie plants in a natural setting designed to showcase native Saskatchewan plants. This garden is intended to inspire students to strive to protect the plants and their habitats. Visit the Pairie Habitat Garden website. The U of S Fruit Program and Grounds department together planted this garden of domestic fruit crops to mark the 100th anniversary of the College of Agriculture and Bioresources. The garden demonstrates the potential for landscaping with fruits to support sustainable local food production and food security. Plant varieties (developed by the U of S Fruit Program) include dwarf sour cherry cultivars, multiple grafted apple trees, Haskap, grapes, and raspberries.